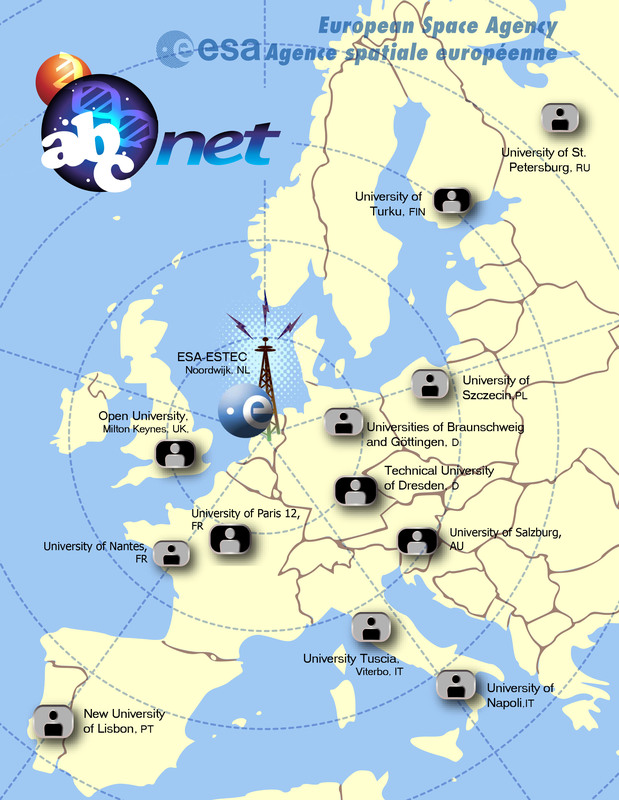 Astrobiology Lecture Course Network (ABC-Net) was successfully running during winter semester (2012/2013). G. Horneck, 9. October 2012, "Introduction to Astrobiology"
H.J. Lehto, 9. October 2012, "Formation of the Solar System"
N.B. Gontareva, 23. October 2012, "Origins of Life: current theories"
H. Cottin, 23. October 2012, "Basic prebiotic chemistry"
A. Rotundi, 6. November 2012, "Comets and the origin of life"
F. Ferrari, 6. November 2012, "Structures and evolution of proteins"
R. Saladino, 20. November 2012, "On the bias of metabolism versus genetics first"
K. Lehto, 20. November 2012, "Most simple (early) life forms"
H. Stan-Lotter, 4. December 2012, "Extremophilic microorganisms"
P. Rettberg, 4. December 2012, "Desiccation and radiation resistance of extremophiles"
F. Westall, 18. December 2012, "Biosignatures of microbial life (early Earth) and the search for life on Mars"
J. Vago, 18. December 2012, "Search for Life on Mars"
S. Onofri, 8. January 2013, "Small black rock-fungi and lichens on the way of Lithopanspermia"
J. L. Grenfell, 8. January 2013, "Atmospheric Biomarkers"
E. Szuszkiewicz, 22. January 2013, "Architecture and evolution of planetary systems"
H. Rauer, 22. January 2013, "Exoplanets: detection, atmospheres and habitability"
R. Demets, 5. February 2013, "EXPOSE facilities"
M. Viso, 5. February 2013, "Protecting the Bodies"
ESA Human Spaceflight and Exploration- Education (article and link) or via Parsec Infotech: ABC-Net lectures. You will be asked to register but the registration is free. The ABC lecture series was held also in 2007/2008 and in 2005/2006. The material of the latter has been presented in the book Horneck G. and Rettberg, P. (ed.) Complete course in astrobiology, 2007, ISBN: 978-3-527-40660-9, Wiley-VCH. The Nasa Astrobio Graphic Novels is a series of graphic history books that chronicle the origin and evolution of astrobiology, produced by the NASA Astrobiology Program. The series began in 2010 to celebrate the 50th anniversary of Exobiology and Astrobiology at the National Aeronautics and Space Administration. All available novels can be downloaded for free from http://www.astrobio.net/nasa-astrobio-graphic-novels/. In 2014-2015 the Italian Space Agency has realized an outreach program for high school students entitled: "Lessons on the International Space Stations", in collaboration with the University of Rome Tor Vergata, University of Milan, University of Naples Federico II and University of Sassari. The e-book version is available on the ASI web site http://www.asi.it/it/educational/liss_a_lezione_sulla_stazione_spaziale_internazionale; the seven chapters describe the human space exploration, the space environment, the International Space Station, the on-going experiments on cells and plants on-board the ISS, and the tasks of astrobiology with a focus on the EXPOSE-R2 space mission. Each of the seven chapters has an introduction written by an Italian astronaut and video messages on life on-board the ISS, life support systems and astrobiology are available as well. The University of Edinburgh offers an online course "Astrobiology and the Search for Extraterrestrial Life". The course consists of 5 weeks of study with approximately 3-4 hours/week of work. The course is held in English by Prof. Charles Cockell. Students who successfully complete the class will receive a Statement of Accomplishment signed by the instructor. The University of Hohenheim in Germany has a Master’s Programme in Earth System Science that offers the opportunity to specialize in Astrobiology. More information on the course can be found on www.uni-hohenheim.de/ess. In 2014, the "Online Course of Planetology and Astrobiology" was held for the first time in Spain. The course was officially recognized by the Professional School of the Association of Spanish Geologists (ICOG: Ilustre Colegio Oficial de Geólogos) and was organized in cooperation with REDESPA (Spanish Network of Planetology and Astrobiology). SAGANet.org is a social and collaborative space for those interested in space sciences, astrobiology, space exploration, Earth system science, sustainability, science communication, and science (STEM) mentoring. Regular SAGANLive events, including the "Astrobiology Coffee Hour Seminar" and the "Talk to an Astrobiologist" sessions are aired live on http://saganet.org/page/saganlive or can be found on the SAGANet.org YouTube Channel.